Flooding can happen… and an accurate flood report can protect you from liability when working with a homebuyer and is crucial for determining insurance needs and marketing your properties. Flooding became a reality, which is fresh in the minds of northern Colorado residents. In 2013, flooding affected 17 counties across Colorado and saw rainfall totals exceeding 20 inches in parts of the state. As a result, IRES is excited to provide subscribers with access to MyFloodStatus flood determination reports on the IRES MLS platform. The reliable information could help ease homebuyers’ minds when purchasing a property while supporting home sellers in gaining interest for their listing. The low-cost, structure-based flood determination reports provide IRES members with a detailed visual verification of the structure location and flood status, showing exactly where flood line is as it relates to the property and the actual house. MyFloodStatus’ Federal Emergency Management Agency (FEMA)-certified reports are the most accurate in the industry and are backed by trained flood specialists who can answer questions and provide expert advice. Real estate professionals face challenges regarding accurate flood zones every day. From rampant confusion and errors to an unacceptably high rate of inaccuracy from free websites and other resources that service many banks and insurance companies, other mapping tools are highly generalized and unreliable. As a result, banks are being fined, realtors are being sued and homeowners are paying unnecessary flood insurance premiums because their flood zone status was misidentified. MyFloodStatus reports help to mitigate these issues by employing rigorous quality control and accurate visual verification to ensure flood risk is fully understood. advisory/preliminary maps (when available) so the property owner can have a ‘heads up’ to possible future changes in their flood zone. At IRES, we appreciate the details the reports provide, including visual documentation, showing how the determination was made on the current “active” flood zone map along with a second preliminary map of the status for properties that will be affected by FEMA map changes (if applicable). Purchasing a report also gives subscribers access to a staff of nationally certified flood plain managers who can guide users to help lower flood insurance premiums, remove properties from high-risk flood zones and advocate to have incorrect flood zone information overturned where appropriate. To ensure accuracy, MyFloodStatus only uses current, effective Flood Insurance Rate Maps (FIRMs) to make determinations. The minute a new FIRM becomes effective, it is utilized in MyFloodStatus determinations. With new structures being built in areas with a recent history of flooding in Boulder County, for example, construction crews may have built up the land in a way to make the new homes less prone to another flood. Only up-to-date maps will support that. Offered on a pay-per-use basis, IRES MLS users will receive discounted pricing on the reports. Subscribers pay just $25 per report, a $5 savings off the normal report cost. In addition to the savings, each determination is backed by $2 million of E&O insurance, which helps remove any liability from the agent providing this report to their clients. Beyond the liability benefits, MyFloodStatus offers subscribers a number of benefits. First, real estate professionals can set themselves apart as the best in the business by having the most reliable information available on every property. By having superior, accurate and reliable information available at all times, you should be able to win more listings as well as the trust and confidence of your buyers and sellers. By utilizing the support from the flood experts with the WTG Flood Resource Center, you’ll save time and money for yourself and your clients. 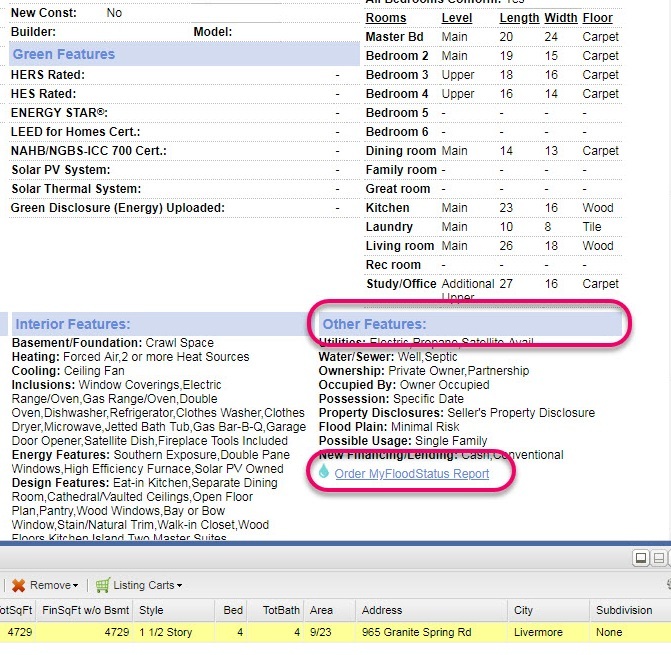 Finally, MyFloodStatus reports provide the ability to market more properties. Now, real estate professionals can market low-risk properties that reside in higher-risk areas with certified proof of a structure’s location in relation to FEMA’s Special Flood Hazard Area (SHFA or 100-year Flood Zone). How Can I Order MyFloodStatus Reports Through IRES? 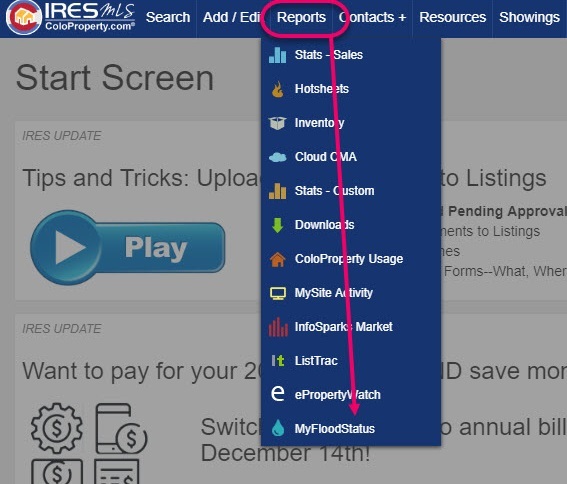 There are a couple of options for ordering MyFloodStatus reports through the IRES MLS platform. Option #1: Main Navigation – click Reports, scroll down to MyFloodStatus (raindrop icon). MyFloodStatus’ precise, certified and insured reports are delivered within 24-48 hours from the time of order. Reports may be delivered sooner depending on the location of the structure in relation to a SFHA. In the end, IRES wants to support reliable data for brokers and their clients, which is why we have included this offering on our platform at a reduced rate. MyFloodStatus will help brokers avoid using free flood reports, which can be inaccurate, and will help buyers avoid flood-related surprises and sellers maximize the attractiveness of their home. The reports can also help IRES subscribers avoid flood zone errors and confusion, win more listings, market more properties, close more deals and stand out as an expert in your field. For more information about MyFloodStatus reports, please visit our information page.